Ask Rahal Your Hair Loss Questions! 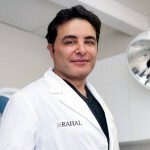 Questions are answered daily by hair transplant experts at Rahal. Do You Offer a No Shave FUE Hair Transplant? How Many Grafts Do I Need for a Full Head of Hair? Can You Transplant 4000 FUE in One Day? Can You Transplant FUE into Scar Tissue? Will I Still Need to Use Toppik after a Hair Transplant? How to Fix My Uneven Hairline? And Estimated Cost? How Much Does Medical Hair Restoration Cost?